Our trendy Personalized Baby Shower Water Bottle Labels are festive and fun! Personalization is FREE! Treat your guests to a thirst quenching surprise! 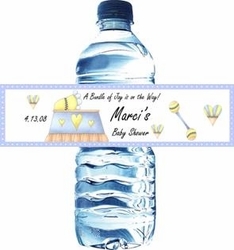 Choose from an assortment of water bottle label designs or work with our designer to create a unique label for a truly custom favor. Our water bottle labels are printed on a laser print. We use premium high gloss paper that will not smudge. Choose from waterproof labels, and non waterproof labels. If your putting your water bottles on ice you will need waterproof labels. Our water bottle labels can match any candy bar wrapper design. So why not order both? You can have matching candy bar favors, and matching water bottles...so cute! We will email you a proof of your label for approval prior to printing.